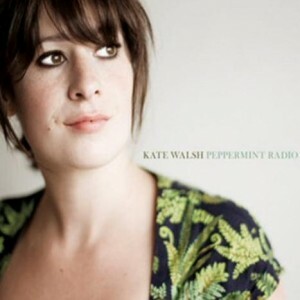 Peppermint Radio is the 4th album from artist Kate Walsh. The album consists of 11 covers of songs from UK artists that have influenced Walsh over the course of her career which has spanned almost a decade and during which she became the only unsigned artist ever to have had an iTunes No.1 Album in the UK or the US. Walsh’s songs have been used on shows like Grey’s Anatomy and in the 2008 films Angus, Thongs and Perfect Snogging and The Crew. She previously performed on National Irish television shows such as Other Voices and The Late Late Show and has toured with Richard Hawley, Turin Brakes, Paulo Nutini, Josh Ritter, Mick Flannery and has just played 6 sold out shows at the Royal Albert Hall with Mark Knopfler. The album is incredibly ambitious with covers from bands like The Cure, Blur, Duran Duran and The Eurythmics. The first single from the album is a cover of Erasure’s A Little Respect. The original is an incredibly catchy and instantly recognisable song, which is unfortunately drained of its best qualities in this cover. The stand out track for me is Kate’s cover of EMF’s Unbelievable. Over the years Unbelievable has been covered by artists like Tom Jones and Weird Al Yankovic and in 2005 was used to sell Kraft Crumbles under the title “They’re Crumbelievable”. So in the 20 years since its release has been used, reused and frankly over used. I didn’t think there would be room for another version of it but Kate’s cover works really well. It’s completely unrecognisable from the original, only the lyrics are the same really so rather than a cover it’s a complete reimagining. There’s no way any artist could possibly improve on Robert Smith’s vulnerable, minimalist vocals. Peppermint Radio’s understated version of Lullaby is very sweet if a little bland. I liked the way the song incorporated a clockwork toy to create a background effect for the song but there wasn’t much else to distinguish it. The one thing I felt the album needed is variety in the arrangements. The songs all follow a very similar formula of piano intro followed by soft vocals leading to a crescendo with some incorporation of other instruments. This meant though that the intros were all very slow and didn’t draw me in enough. It felt very safe. In Feeling Oblivion there’s a lot more variety in instruments with a more violin heavy intro and it feels a lot more uplifting. Walsh’s earlier albums were very heartfelt and she’s clearly a good songwriter but I just don’t think enough was done to pay tribute to such well known songs. This entry was posted in Music and tagged Grey's Anatomy, Kate Walsh, Peppermint Radio. Bookmark the permalink. It consists of gritty, raw and dark hip hop. Even got it featured in th Arts section of the Sunday Tribune!